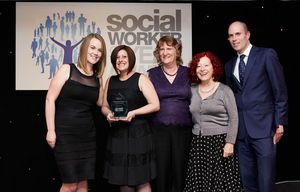 At an exclusive awards ceremony in London last month, the Daytime AMHP (Approved Mental Health Professional) Service was announced as the winner of 'Team of the Year, Adult Services' in the Social Worker of the Year Awards 2016 as a result of their outstanding work with vulnerable adults. The team was nominated in the summer by Anna Grainger, then DCC Commissioner, who received statements of support from a number of Consultant Psychiatrists from Devon Partnership Trust, Director of Operations, Dr David Somerfield, and colleagues from the Street Triage team. The service made the shortlist of five teams from across England chosen by an independent panel. The team, which includes both AMHPs employed by Devon County Council and assigned to DPT, and non-assigned AMHPs, was launched in summer 2015 in response to many challenges which included the professional isolation of AMHPs spread across the county in different mental health teams, high staff turnover and high stress levels. A new AMHP management team was introduced, led by Service Manager, Robert Lewis. Robert was instrumental in designing the service following a major consultation exercise spread over nearly two years. There are around 29 AMHPs, including the management team, plus a Service Support Officer. 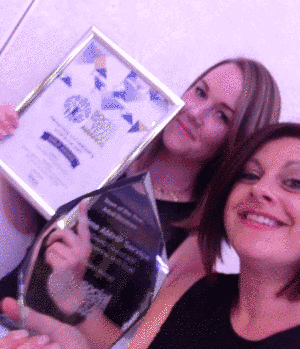 Megan Hornsby and Louise Wheavil from the team (pictured here) attended the event. One of the judges, Lyn Romeo, Chief Social Worker for Adults, commented: “This team has been designed and shaped by practitioners following authentic consultation and although responsible for a specific statutory function, has ensured a wider focus on good social work practice in mental health and supporting locality teams and health colleagues to do the best for people in mental health crisis”. Devon’s new daytime AMHP service was set up in response to a familiar litany of problems. These included high stress levels among the county’s AMHPs, high staff turnover, and practitioners being isolated in different mental health teams. Following a full launch in June 2015, these issues have been addressed, something the judges described as “very significant, in a service area which in most places is in crisis”. Through embedding reflective practice and peer supervision, the team has also succeeded in placing social work values at the heart of an often medical-dominated area. The AMHP service comprises a central unit and five locality teams. AMHPs work flexibly across the whole county, travelling as needed to deal with local spikes in referrals. During quieter times they are encouraged to work on development of themselves and their service. Taking time off in lieu is also something the management team insist on, helping ease the pressure of the job. Turnover has stabilised, and with an eye on the longer term, a new ‘trainee AMHP’ role has been developed. This not only adds support to the team but has helped increase numbers of applicants wanting to train as AMHPs to a 10-year high.